Summer Bucket List: How'd We Do? This morning I sit alone at my computer with my cup of Blueberry Bliss (I am a Teavana convert). The kids returned to school this morning and now I must return to my various volunteer duties and toy with the idea of getting a job (the guilt of a SAHM with no kids at home...it is fierce). It is time to declare summer over and move on to the joy that is autumn (my favourite!). 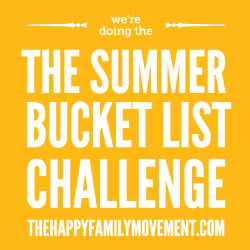 We had so much fun playing along with The Happy Family Movement and their Summer Bucket List Challenge this year. It was our first year and it was so fun to plan out our summer wishes. I also made new friends on the facebook group and even won one of the blog giveaways. Yay! We're not great goal setters, we're more pantsers (as in "fly by the seats of our"), so how did this little experiment in ultimate summer planning go? Visit 3 waterfalls Yes--we did 5 and we still have waterfall fever. Blogged a bit here and here and here. Still have photos to blog of the day we did 3 in one day. Ice cream for dinner We did this a few times, but our first opportunity was back in May. Movie night with snacks We managed to do this a couple of times too, but I didn't take photos. Get a penpal This was N's item, and she met some new friends at BFF camp and exchanged addresses with a girl from PEI. We'll see how it pans out! A also made a penpal at BFF camp and has already sent off her first letter. Plant a garden I built a garden (thanks Pinterest) and planted herbs and marigolds, but I didn't get the lettuce and peas and carrots planted. So I'm calling this a half success. The good news is that I have the garden ready to go for next year. And my flower beds are doing pretty well. I'd like to add some new fall bulbs, but that's for a different list. Read 100 books We forgot to keep track! Whoops! I've read probably 50, though many of them were short free reads (I like you, kindle). Hubby probably only got to 15-20, but he prefers non-fiction, so he doesn't devour books like potato chips the way I do. The kids read every day, but they often re-read favourites, so if you count each time through as 1 book, they made 100, other wise it's probably 50-75. Still a good reading summer! 10 Random Acts of Kindness We found this one hard to keep track of too. We didn't manage any co-ordinated family acts of kindness, but every now and then someone would report doing a personal act of kindness. I'd like to take another, more focused, run at this. Perhaps this will be the year we finally do the 12 Days of Christmas Kindness. Watch a meteor shower We tried, but we either had bad weather or we were away. We were really looking forward to the Perseids shower in August but it happened while we were at camp. The girls and I caught a bit of the show but I don't think the boys did. Next year! Play in sprinkler Yes...sort of. We hooked up the sprinkler and it didn't seem to do much, so the kids decided it's more fun just to spray each other with the hose...while bouncing on the trampoline. They did that LOTS this summer. We were given a new sprinkler by friends and couldn't get it to work either. We think it's a water pressure problem. We've been having water troubles (again). Sleepover A had a sleepover at a friend's house, but the other two weren't invited anywhere and I wasn't up for throwing something. We did have house guests a few times, so we had sleepovers then! Scrapbook (complete an album in progress) Another summer has gone by with me not getting to my scrapbooking supplies. Argh! I miss it. Family hike We went on a few walks, and a few of our waterfalls (Hayes) involved a decent hike, but we didn't get around to doing a separate hike. Make a basement playroom (clean basement, put up shelves, etc. we're not renovating, just organizing) We cleaned out all of our recyclables, and I cleaned up and out the pantry, but we're not there yet. Still a lot of organizing and cleaning to do. Swim in a lake We didn't make it until July, but what a swim it was! Got a couple other good swims in too. Swim in a pool The girls and I got some pool time at BFF Camp, but the boys didn't make it and we didn't get to swim together. Another half tick. Swim in the ocean Just the once, but it was lovely. Stargazing A little, but my vision in my head of us lying on blankets looking at stars never really happened (too many mosquitos!). Family camp We didn't get the opportunity to camp as a family. Sad. Make a new family playlist and listen to it a lot! Made in time for Canada Day. Great list! Our favourite summer song has been "Brave". Go spelunking Sadly, no. We did some internet research and it seems the province isn't the best spelunking spot. I've bookmarked a couple of ideas of places we might brave, but it's looking like a guided tour might be best. Karaoke Party with Cindy Yuppers! Camp Chip Yep! Great camp this year! Rainy day PJ party We had a lot of rain and we're very lazy, so this got checked off a few times. Visit a farm The girls and I visited a Dairy Farm while at BFF Camp. The boys could use a farm day still though. Fortunately Open Farm Day is coming soon. We'll just slide this to a fall list. See MaryLou Nichols and Lennard Nichols Yes. Yay. Watch a sunrise I watched a few, but we didn't wake up as a family specifically to watch. Campfire with s'mores The girls had s'mores a couple of times at camp, but we haven't had our own family bonfire yet. Fire bans were plentiful this summer. Make 100 friendship bracelets We made it to 40 and ran out of steam. Library program We signed up, and the kids read every day, but they didn't fill out their passports and we didn't make it to any of the program days, so this one is another half check. Board game night We had a board game night when my Mom was visiting in July, and then last week when we were unplugged we had one every night...and we taught the kids Euchre. Good times. Watch a sunset We enjoyed a few, but I only photographed our lake time. Make cookies A few times! Also multiple batches of fudge and a loaf of banana bread or two. Playdates with at least 2 different friends/families The girls each did, but C only had playdates with one friend. He says he's ok with that though. Play on 3 different playgrounds 4 at last count. Fun! Wii Marathon As with rainy day PJ parties, there were plenty of rainy days for Wii marathons. Picnic for Daddy's birthday Indoors, but it counts! Hide and seek The kids played lots, the kids and I played a couple of times, but we haven't done a massive family version. We did come up with Hide and Go Teddy though, where I hide Blue Teddy and the kids have to find him. This is C's new favourite game. Kingsbrae Garden Concert Loved it. All in all, we've all declared the summer a success. There were some things we forgot to put on the list, like Harvey Community Days and blowing bubbles, but we did them anyway. We kept finding reasons to hang out in St. Andrew's and renewed our Aquarium Membership, something we weren't sure we would do. We had unplanned visits from both my Mom and Stepdad in July AND my Dad and his family in August. We developed waterfall fever and fell a little more in love with our province. We laughed a lot. We had late nights and early mornings and long, lazy afternoons (often with naps). We looked for Northern Lights, marveled at fireflies, caught frogs and grew pretty flowers. We made new friends, we cherished old friends. We made memories. It wasn't all sunshine and roses, but when we look back the good far outweighs the bad and hopefully will be the part we remember. We enjoyed the Summer Bucket List so much that we're going to make a shorter Fall Bucket List, which will include a few little things that we didn't get to this summer (like our bonfire with s'mores and visit to a farm). I'll keep blogging here and there so we don't have radio silence again too (I still have a few summer things to blog). Thank you summer. Thank you bucket list. Thank you Happy Family Movement. We have been super busy lately with a combination of being horribly lazy (lots of rain days around here) and trying to pull ourselves and our gear together for the big Guiding Camp that starts on Sunday. Into this enter a phone call last week from my Dad. He and his family are moving from Ontario to Newfoundland. We couldn't let them pass through the province without seeing them, so we're adding in a layover from them, oh, tonight sometime. Combined with all our camping gear everywhere, that's going to be interesting. So we're checking items off the list, having fun, keeping busy (and then some), but I don't have time to edit photos or blog our experiences. Hopefully soon! In the meantime, I'll be away from the internet from Sunday morning until, well, at least Sunday morning. Sorry blog! Last Monday morning the kids had appointments for their dental cleanings. Our dentist is only a couple of blocks from Hubby's work, so we drove him to work, parked there, and planned to walk to the dentist. Except we had an hour to kill before our appointment. Lucky us, we were also only about a block from an elementary school, so we added another playground to the 3 we've visited so far this summer! This school, Montgomery Street Elementary, has a climbing tree that the kids LOVED. They just kept coming back to it again and again. You can pack a lot of fun into one hour! We think that, just like waterfalls, we should bump our number of playgrounds up from 3. I wonder how many we can get to before summer ends? When Hubby and I first moved to New Brunswick 13 years ago the Nichols family were among our very first friends. MaryLou was (is) a beautiful scrapbooker, and I was also into scrapbooking, though I was self taught from the internet and had never actually met anyone else with the hobby. I did such a happy dance when I realized I had found someone as crazy about paper and photos as me! Lennard and Hubby enjoyed gaming and man talk together. As couples we shared faith, callings, hobbies and so much more. They were warm and welcoming and helped us feel that this was really our home. When we decided to stay in New Brunswick and purchase a house, they stepped up friendship in a MAJOR way; there was a problem with the legalities, discovered only days before we were supposed to move in and the lease was up on our apartment. We were about to be homeless, and renting a motel room for an unknown length of time would likely have bankrupted us. They graciously offered to share their home for the "week or so" it would take to clear up the issue. The week turned to two...to three...and so on. We ended up living with them for almost 2 months! That's true friendship (and did I mention that those two months went up to and PAST my due date with the Princess?). MaryLou was our first visitor when the Princess was born, first to make her laugh, gave her her first girly outfit (and the one she came home from the hospital in). As good friends do, they were there for our ups and downs (as we tried to be there for theirs). We've cried together many times and laughed together many more. When they decided to move out west, closer to family, we celebrated for them and mourned for us. And we sit every day on their old grey couch and think happy thoughts of them. When we heard that they might be flying out here this summer "see Len and MaryLou" went to the top of my Summer Bucket list. When they got weathered in an extra day in Gatineau, it started to look like it was going to take some tricky planning to pull off, but we got to see them! They stopped in for a VERY quick hello at church and I didn't even cry until we were back in the car! It may have been the fastest visit in history, but it was wonderfully dear. Thank you Lennard and MaryLou for coming to say hi! You can follow their amazing cross-country flight on their blog, Nichols' Nuthouse. The trip is most of July, so hit the archives and start at the beginning. MaryLou has taken some incredible photos! After a crazy beach day and silly game night, Wednesday dawned gloomy and grey. We waved Hubby off to work (he only took two vacation days) and shortly after we waved Mom and Terry off on their way back home. And then we all exhaled, wound down, and were DONE. We did a lot of laying around. There was some movie watching, some reading, some light housework, but mostly we just let ourselves go. We all agreed to stay in our pj's and do absolutely NOTHING. Around mid-morning the sun tried to shine and Sweetpea asked me if she could make some cookies. Sounded good to me! Triple chocolate chunk cookies. They were super yummy! No sooner had she put the cookies in the oven when the skies opened up and the rain started pouring down. Suddenly our nothing day turned instantly into "rainy day pj party" and "Wii marathon", with fresh-baked cookies to celebrate. 3 bucket list items in our wonderful, lazy day. Sometimes doing nothing is the best gift of summer. One of our summer bucket list items is "swim in the ocean", and Mom and Terry love St. Andrews as much as we do, so, even though they'd made a day trip there on their own already, we all piled in our cars and went off for a day at the beach. Hang on, it's another long one! There's a beautiful building at the entrance to the beach that has showers, bathrooms, changerooms, meeting rooms....it used to be open to the public and part of what made the beach fantastic. Sadly it was completely closed off and we were directed to change in a rather nasty port-a-potty thing. It was EWWWW. I very sincerely hope that the closure is temporary and that the new owners (Mariott) will have it open to beachgoers again soon! Once we had our suits sorted and our spot on the sand staked out (except the men, they decided to sit in the shade and read) it was time for the water! I have one mermaid...excuse me, sea otter, who is fearless in the water. She had leapt off the deep side of the floating dock before I even got down there. She makes me thankful for lifeguards, though it was almost low tide with the tide still going out, so it wasn't exactly deep. My other two are a little more cautious and like to get in the water veeeeeeeeeeerrrrry sloooooooooowly. They eventually get the hang of it though! Once everyone was happily in the water (except Grandma, who decided it was too dirty for her after being spoiled in Cuba this winter) I put my camera away and had a little swim time myself. It was wonderful! All I remembered from swimming in the ocean last was that it was cold and dirty and tasted terrible, but this time the water was nice and warm. Ok, it was dirty (seaweed city!) and it still tasted bad, but I floated so nicely! I really enjoyed playing around. Sweetpea and I started swimming together and I showed her how I could throw her if she stood in my clasped hands. I had tried to teach her a couple of years ago but either I wasn't doing a good job of teaching or she just wasn't ready...either way, it failed big time then. This time she got it on the second try. Her eyes lit up and she was hooked. I must have thrown her around for a half an hour or more. When I finally got tired and begged for a break I floated on my back, and she came and floated on top of me with a giggled "We're SEA OTTERS!!!". Funny girl. It was some seriously great one on one time. Meanwhile, the men enjoyed the shade (smart, this Mama got a pretty good sunburn!) and Grandma guarded the beach. The Boy tired of the water first and changed back into his street clothes. He bugged the Grandma a bit, he bugged the Daddy a bit, and then he noticed the playground behind the Daddy and set off to play. Once the Princess figured out what he was up to she charged off to play too. Sweetpea was having too much fun in the water to ever get out, but once I decided I couldn't throw her any more she came out to play too. Eventually we needed to feed the masses, so we brushed off the sand, threw on some clothes, and headed into town in search of food. We ended up at the Lumberjack, a yummy little sandwich shop, where we enjoyed the cool ocean breezes and warm company found on the back patio. When we finished eating we enjoyed wandering the town a bit and even doing a bit of shopping, but the kids' main focus was ICE CREAM. We satisfied that one with a twist, enjoying a spot of gelato before hurrying off to the aquarium to make sure we were on time for the seal feeding. I told Mom she needs to use the "hair ornament" photo on the left as her new fb profile. ...and I think I've maxed out this post, just like we maxed out our day. We had pizzas and a salad bar once we finished up at the aquarium and went home. It was a very full and very fun day--hopefully a good one for Mom and Terry's last day with us. PS. For those keeping track, we get to cross off "swim in the ocean", "play on 3 playgrounds" (this was our 3rd) and later that night, "have a board game night". Monday of Mom and Terry's visit dawned just as hot and nasty (or was it worse?) as the day before. Shortly after lunch Terry started not feeling well again and went out to the car to rest. I gave Mom my key so she could take him home while we bought a watermelon and then headed home ourselves. We bought the watermelon just fine but...we were in the mood for some greater adventure than just going home. We had some printed out directions in the car to some different waterfalls that were practically on the way home, so we decided to detour a bit. Our first choice (and a good one!) was Garden Creek Falls. It was incredibly easy to find, just off the Fredericton on-ramp to the TCH and down a little ATV trail. Again the lack of rain meant that the water was just a trickle (a friend told me that she was there with her family last month and it was rushing water) but we liked it like that; so much easier to scramble up and down and over and under! The cold water felt soooooo good in the heat. We definitely dragged out our playtime. Flush with our success and wonderfully cooled from the water, we drove off to find our next waterfall just down the road from the next exit. Alas, that one was completely dried up, though we could see evidence of where it should have been. Not even a trickle. Then we were sad, hot and tired and headed home. Waterfall Verdict: Everyone still likes Joslin the best of the ones we've been too, but we loved how easy Garden Creek was to get to, that it's practically on the way home (small detour) and the step style makes it really pretty. We'll definitely return again and again! AND--we got home and ordered the Guidebook on amazon, because we've been having so much fun and wanted to support the blogger/author. What a great resource! On the Sunday of our week-long visit with Mom and Terry we had a loose plan to check out King's Landing and have some fun time travelling, but we woke up to some crazy high temperatures and humidity and no one much wanted to move, let alone set foot outside the house. Terry has a medication patch that reacts with the heat and had already kept him from the Strawberry Social the day before, so we didn't want to risk him getting sick again. Instead we had a quiet, lazy Sunday morning at home (except me, I decided to do some gardening and managed to blister up both thumbs). By afternoon we were climbing the walls a bit and Mom and Terry had been talking about checking out the music down at the pub. There were flyers there earlier in the week for a "Celtic/Folk" group and they thought it would be fun to check out. It sounded good to me (better than sitting around watching Bugsy Malone, which is what Hubby and the kids did) and away we went. The group was "Atlantic Standard Time" (I love a clever name) and they did a bit of everything; folk, blues, country...and when we mentioned during break that we came for Celtic, they went ahead and threw in a bunch of those too. They had a great sound and were super friendly and laid back, and best of all, they encouraged us to sing along. Loved it! Our quest for local waterfalls continues! Mom said that she wanted to help us cross some items off of our list when she visited, so we gathered her and Terry and our friend Cindy and drove up to the Maliseet Trail to visit the waterfall we'd heard the most about; Hayes Falls. This one was recommended multiple times by local friends on facebook, including the local Outdoor Pursuits teacher at the high school. We'd heard that it was possibly the highest waterfall in the province and that the trials were well-maintained, so we were expecting great things. Mom had knee surgery this winter and Cindy is waiting patiently for much needed surgery of her own. The trails were well maintained but there were roots everywhere. It was a bit tricky if you had bad knees. Walking sticks and canes were put to good use. We finally got to the part of the trail where it split and you could go to the top of the falls or the bottom. Unfortunately, the trip to the bottom was very steep and way too treacherous for Cindy, and the view from the top wasn't great. We haven't had a great deal of rain in the past few weeks and the water flow was...kind of uninspiring. There was a small, mostly stagnant pool at the base as well, about the size of a kiddie wading pool. No one wanted to go in. Still, it was quite high and it was pretty. I think if we were to go back in the spring with the run-off or after a big rain in the fall it might be more awe-inspiring. The water lines on the rocks and the debris at the edges of the stream suggest a much more powerful display at different times of the year. The trip back up had me thinking I need a better fitness routine (it probably would have helped if I'd stuck to the trail, but my boys and I decided it would be quicker to climb up our own way) but the view through the trees was enjoyable. My boy and I were feeling daring, so we sat out on the edge of the falls and enjoyed the view from the top. We had a light picnic at the top (yay for picnic tables! ), explored a little more and then headed back out. We were on a bit of a deadline to get to the strawberry social at church and the hike and the heat were enough for most of us. We did enjoy the adventure and all the nature though! There are varied opinions but I thoroughly enjoyed the day out with family and friends. Waterfall Verdict: The hike was hard for some, the kids were unimpressed, the bugs were bite-y. The Boy was very clear in declaring this waterfall a "boring, stupid, terrible waste". Harsh! I liked it, but was a little disappointed considering how many people had told us how great it is. I think we'll come back to it next spring and see if more water will improve our collective opinions. In the meantime, we're starting to think our first waterfall may have been the best. *Everyone who recommends the falls on facebook spells it Hayes with the 'e', but the website we're using as our guide leaves the 'e' off. I have no idea what the "correct" spelling might be. Immediately after coming home from Guide Camp we dove into a week of Vacation Bible School. The local Presbyterian church hosts with support from the neighbouring United Church and friends from the community all pitch in. Everyone is welcome, and the class I taught had catholics, mormons, united, baptist, presbyterians and kids that happily admitted that they don't go to any church. I'm pretty sure there were more denominations present in the other classes; didn't matter. Our kids went last year and had a great time. This year I was approached by one of the organizers to help out as a teacher and I optimistically said yes. I had NO idea what I was getting myself into! I had dropped the kids off last year and only stayed to watch a bit on the first and last days. Having never attended such a thing as a child myself, I wasn't really sure what the lessons entailed or how much planning was involved. I worried needlessly (I usually do). They were super organized and I had a lesson plan for each day with freedom to tweak it as needed. I was really only responsible for my lesson and supervision, the games were run by a bunch of teen volunteers, the crafts were prepared for us and just needed my guidance...all was well. Plus my class agreed that we had the COOLEST classroom ever--couches and a big comfy chair and a coffee table; it was more lounge than classroom and we felt very special. The Boy had decided that he didn't want to go this year and was trying to get out of it, but we found out just a week before that some of the classes needed to be adjusted and I would be teaching HIS class and suddenly he was good to go. It was pretty flattering to me as a mom that he wanted me to be his teacher (I don't know how much longer that will last) and I had fun getting to be with some of his friends and classmates. Our theme for the week was "PEACE" and we talked about all the different ways we could be a peaceful people and accept and share God's peace with the world. We had a different word of the day each day; Aloha, Shalom, Agape, Ubuntu, and Heiwa and we talked about what each word meant and how we could add it to our lives. It was really cool and really fun. On the last day I pulled out my camera a bit; everyone was wearing their VBS t-shirts and having a blast! "Snack" time. A daily feast! I have to give a shout-out to my neighbour Barbara from up the road. On the first day we dutifully got up extra early and drove Hubby in to work so we could have the car, then went to pick him up at the end of the day. She found out what we were having to do and drove us the rest of the week. It made our week go so much smoother! Thank you Barb! A couple funny faces from my class. You can see why I had such a fun time. I hope they ask me back! The Princess went this year as a junior leader and got to help out with the Kindergarten class. She is now in love with those kids and hopes she gets to help out with them again next year. I think VBS will be on the Summer Bucket List for years to come! The title of this blog comes from my best friend's mom; who critiqued my high school English journal as "full of superfluous fluff". This is where I embrace all that fluff and share it with you in its pure, unedited, rambling glory.